This morning it was still "Downloading" so I unpluged it and pluged it back in again and it worked perfectly! Didnt reboot or anything, just unplugged and plugged back in. I probably could have done that last night!!! I reset the RanDisk Z to 16 MB, though it didnt mention this in the instructions, after I got a "Low on virtual memory" warning when I tried to run IE to go on line and get TightVNC to set up the server. Resetting the RamDisk didnt help. I still get the "Low on Virtual memory" I really need to get TightVNC going as I dont have a spare display for use on the TC. I noticed that I also have on the desktop "Remote Desktop" or something like that. I think it is a program to remotely control the TC similar to the TightVNC. Can I just delete that program? And where? You can leave RamDisk at 16mb. Try increasing the EWF volume size to whatever maximum size is available on your machine. EWF is intercepting the Virtual Memory disk writes. If it is too small, it will give memory errors. There should be an option to configure EWF settings in the control panel. If you use Windows on the remote machine you can try TeamViewer instead of VNC. This whole exersize began because my wife was cussing the MJ because it was cutting out. It sounded like a wideband signal wandering around in a narrow band channel. I attributed it to some sort of instability in the computer I was using since the "Great Upgrade" that trashed the TC. But I am now beginning to suspect the cable modem. My provider said they would quit supporting the modem THAT THEY SOLD TO ME on January1st. I put in the new modem that they made me buy today and I must admit, it is faster so maybe they had already started to nudge us out with bad service even before the deadline of January 1st. The new modem got rid of most of the chopping up. Now its only occasional 1 second out of 20 seconds. Livable. edit: I just found the one second out of 20. I was watching the router and noticed a one second drop out of the internet every now and then. When it dropped out the WiFi channel also dropped out. I am not using the WiFi right now so I unplugged it from the router and lo and behold, the dropouts stopped!!! Must be something wrong with the WiFi card. The memory problem was "operator error" I forgot that a while back when the TC was not working with the MJ I had scavanged the 512 MB memory card for use in the TC that I have set up in the car and had put in a 256 MB card. The TC will just barely run the MJ with 256 MB memory, but if you try to run anything else, like TightVNC at the same time it wont handle it. My new problem is lack of download of the contacts list. But I can live with that, its like being back to AT&T again....almost. Posted: Tue Jan 12, 2010 1:06 pm Post subject: Configure to boot up and reload MJ after power loss? Thank to all the helpful individuals here that take thier time to help! The dummy guides are just what this dummy needed to convince me I could take this on and maybe even get it right. I just ordered a 5700 256/256 (ebay $59 delivered in box like new). 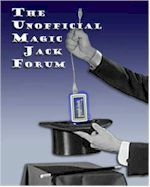 Plan on upgrading to 512/512 and using magic jack only on it. My plan...is to use a KVM switch to toggle my 2nd montitor between the MJ and the 2nd monitor port on a mac mini. I also plan to try using a powered usb adaptor (any suggestions?) and hooking it up to my home wiring and powering 3 or 4 phones...hopefully. I figured I would better benefit learning how to set up my own TC instead of buying a preconfigured one off of ebay. I did notice on some of the ebay auctions that the 5700 could be configured to restart and load MJ after a power outage. Does anyone have any information that they would care to share about how to set this up or possibly a link to the info if it can be found here? I did alot of reading here but haven't come across it. I can't wait for my new toy! Thanks again to all who contribute here! Instead of switching monitors, try TightNVC to access the telephone server from the Mac on the Macs monitor. I think TightVNC will run on a Mac as it runs on Linux. Go to TightVNC.com to check it out. I can't seem to find them at HP's site. Can someone point me in the right direction? Thanks! Posted: Sun Mar 21, 2010 12:36 am Post subject: I got a problem using the guide. So I've formatted my 4GB Kingston USB Flash Drive using the SP27608.exe now when I try to run the SP29705.exe then select USB Format I get this error. Theirs no write protection on it though. I used SP27608.exe to Format as FAT32 and use the win98 DOS documents from the guide. Is my USB being 4GB the problem? I had the same message with a 4gb Duracell USB stick. I tried a 2gb by a different manufacturer and it worked fine. Not sure if it's the size or make, but try another one if you have one handy. Posted: Sun Mar 21, 2010 2:37 pm Post subject: Will do. Aight thx for the quick post. I've seen some post where they had trouble with 4GB drives and some that had it working I'll try a 2GB. Thanks again. Posted: Sun Mar 21, 2010 5:53 pm Post subject: Re: Configure to boot up and reload MJ after power loss? Did you get an answer to auto-restart? When you get your TC, in the BIOS settings, there is a setting for how the TC behaves when power is restored. One option is for the TC to automatically boot up. It's an obscurely named option so you'll have to hunt around in the BIOS settings. So after a power outage, the TC will boot right up again. Sorry I don't have my TC handy to check. Also search the forums here, I recall discussion on this feature. Posted: Mon Mar 22, 2010 5:53 am Post subject: Need different version.